A look at who has won the most medals at the 2018 Winter Oympics in the first 11 days. Norway continues to lead on the medal table but Canada is closing in after 11 days of competition at the 2018 Winter Olympics in PyeongChang, South Korea. 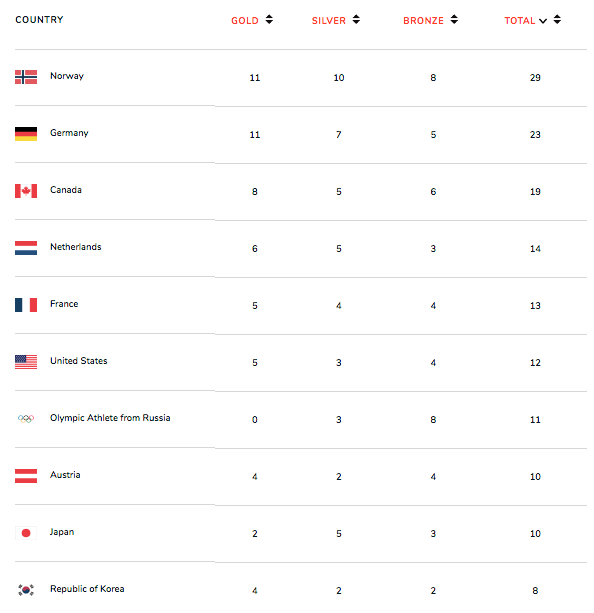 Norway leads with 29 medals overall—11 gold, 10 silver and eight bronze. Germany has just as many gold medals but just seven silver and five bronze. Norway took gold in the men's team large hill ski jumping on Monday with a team total of scored 1,098.5 points. This marked their second ski jumping gold medal of these Winter Games. Germany finished second for silver. The Germans did manage to get a gold medal in an unusual manner after they tied Canada in the two-man bobsled. The United States picked up a pair of bronze medals with American siblings Maia and Alex Shibutani in ice dancing and then with Brita Sigourney in the women's halfpipe ski final.